The 33" max is no longer applicable. I emailed Eaton about this for the 35's on my Bronco and they said it would be fine. Cool, I wonder if it would hold up to my truck with the new updates, BB, 35s, stick and all. I would rather have a LSD up front but I an afraid I would break it. Not unless you are trying to do 4wd burn outs on asphalt. Yup I am, childish yes but what else do you do with a big block and a stick LOL. I definetly plan on going to the strip with it and see what it'll do, maybe high 9s. Better plan on Detroit's at both ends at least. Better hope that front Detroit doesn't lock or you will not be able to steer. Or just stay in 2wd if that what you want to do. With a trutrac in the front using it like you are wishing to will end up with you chasing it back and forth across the track. End up slapping both walls. Only truly safe way to do what you want is with an open diff in the front. i really wish i could do Truetrac in my semi-floating 10.25"
Bronco Info: Stretched 96 5.8 with many desert mods. I'll plug for the detroit locker! I guess you talked to the wrong guy? My first axle was a 10.25 with c-clip eliminator kit and ended up as a semi float. It was a good setup , but I came on a bargain racing 9" and did the swap. Last I heard the guy who bought my 10.25 is still beating on it after 10 years. I installed an ARB in that axle and do not know if a Trutrac will work? Did you know that Ford used a semi float as OEM on some trucks? Keep looking to find the parts you need. And for sure talk to the shops that are building off road axles in order to get real world info. Not sure why the original grenaded. 8.8 Trac-Lok carriers are notoriously week due to all the material removed for the ears of the driven discs. i have emailed Moser and Strange and they will not make a c-clip eliminator for it. who made the eliminator kit for yours? i know some 10.25 came factory c-clip. but there very rare cause only some light duty f-250 used them. 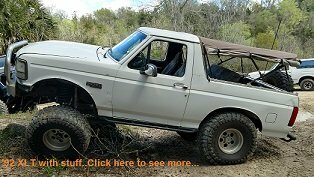 my 90 F250 has a c-clip 10.25 and the axle and i used a c-clip axle from a 97 F250 for my 5-lug conversion. x2 I couldn't have summed it up better myself. I love my Detroit lockers, even before they came out with the new Soft Lock version. I have a Trutrac in my '03 Lightning. Been in there for about a 100k miles and still works great. And yeah, it gets beat on too. Sorry for the old bump but this is a subject I'm researching and I need more info. I'm planning for a '96 build. And 5% street/strip fun, scaring Mustangs. The TrueLoc looks like the way for me to go, for the stock rear. But the front is where I'm having trouble, since I'm new to 4x4. Are you suggesting that a TrueLoc in the front could potentially cause me issues if I'm on the street, pedal to the metal, and maybe even getting into the twisty roads a little bit? Why would it cause any issues if I don't have 4WD high or low engaged? I'm honestly a clueless newbie on this subject, so please don't flame me. Talk to me like a child. That will work better. If you have manually locking hubs what you have up front is irrelevant until the hubs are locked. If you are running it on a drag track with the hubs locked you are going straight your steering will be minimally affected. A LS is more forgiving than a Detroit. If you are only off roading 15% of the time which one is cheaper.